Qn: What is your ideal working environment? – space, music, lighting, etc. I can work in most environments as long as they have long unencumbered walls and no windows. The caveat is that whatever the environment, it has an impact on my work. It determines in not so subtle ways my approach to my work every time I enter it. I had a theater in NYC and my method of writing and directing my plays has remained with me. When I am developing a series, I inhabit the character(s) I draw. I become them. 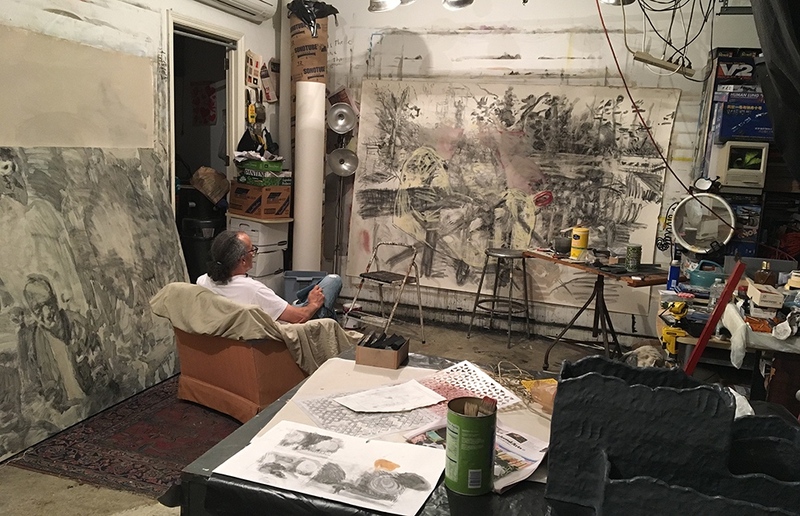 Paranoiac, or senile, or anti-heroic – I build my drawings as both director and actor, controlling the handling of the charcoal to reveal the actions of the characters or the mood of the environment. So the studio is both an antagonist and protagonist within my technique. The best studio I had was a basement studio that covered a half city block. I was able to work on complete series at once. I grew accustomed to the artificial light and serious lack of ventilation. Subterranean and bolt-locked, it was a physical construction of the themes I dealt with at the time. 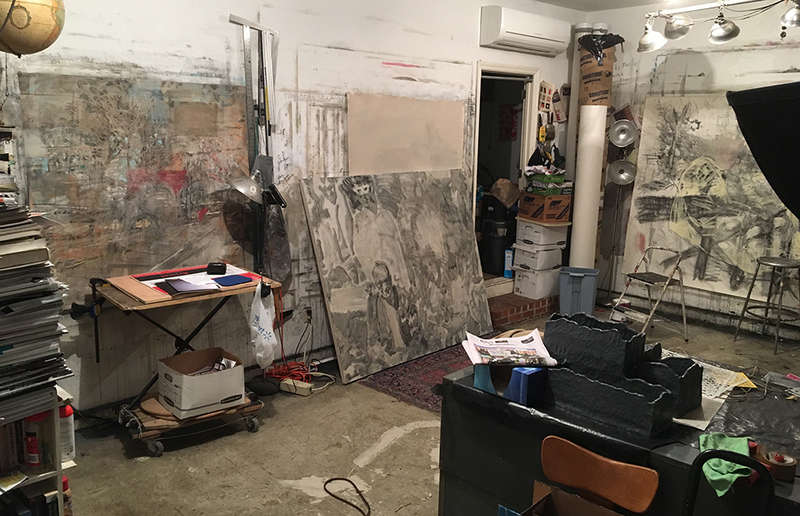 Currently, my garage studio is a crowded space, open to intrusion and attached to house distractions- filled with boxes, old rolled up drawings and paintings, webs of extension cords, miscellaneous piles of materials encroaching on my working space. It is a perfect studio for the late series dealing with cubicles, work routines, hoarding, dreams and dementia. My ideal studio, though, the one I have dreamed of since middle-school, is a barn studio. 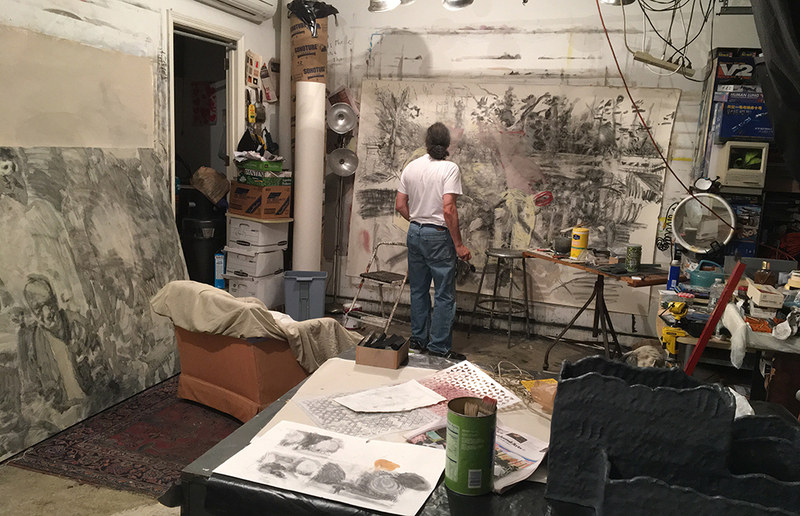 My mentor, who was a liturgical artist, had set up his studio in a barn outside of town. It was wonderful – huge open spaces, unencumbered wall surfaces, massive storage areas, and isolated. Someday I will find one just like it. Qn: Is there a specific motivator in getting you into the studio? – after morning news? coffee? after family is asleep at night? I don’t have any specific motivation for going into the studio. I arrive there by habit. The start is always the problem. I spend a lot of my time thinking through ideas and working on translating those ideas into images. I am not an artist who starts by playing with the materials or with some kind of ritual. Every drawing is a deep hole I’ve dug, climbed into and then attempted to get out of. Qn: What is your preferred medium? Do you work on one project at a time or several? I work almost exclusively with Grumbacher #16 medium square vine charcoal on paper prepared with a taupe (Bailin Gray) eggshell acrylic paint and enhanced with coffee staining, kneaded erasers, rags for wiping off images, and occasionally pastel, oil or acrylics. Though I prefer my drawings to be clean of special effects, and dislike multi-media as a technical copout, I use it when necessary – specifically to create contrast between forms, to move the narrative, and to play with visual weight. I work large because I like drawing from the shoulder rather than the wrist. I concentrate on one series at a time and work on several pieces when space allows. Qn: Is there anything you would like to share as personal interests outside of the studio – outdoor activity, cooking, reading, museum/gallery hopping? I have an anemic life outside of the studio. My interests are limited to my family, running, reading and listening to audiobooks, watching movies, teaching drawing and theory, and collecting images torn from newspapers. Qn: In what way is your work a reflection of “tradition by way of ‘method'? What could be more traditional than drawing? 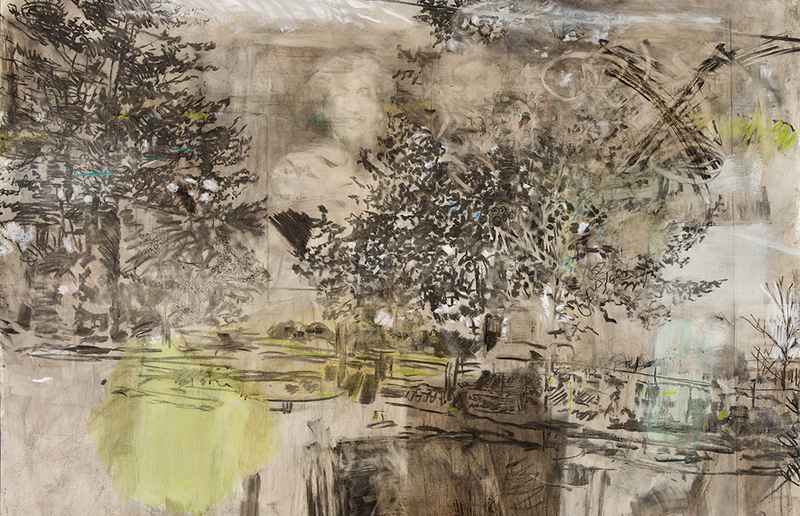 But while I like the idea of finished drawings, the best drawings I have seen, the ones that move me, remain in the traditional meaning of drawing – a study for something else, a practice in description, or impression of something, a suggestion. Most drawings, whose surfaces show no fractures, seem self-conscious to me, or overworked and tired looking. I prefer the unfinished to the finished, the underdrawing to the final, the raw to the cooked. Because drawing is so raw, so close to pure idea, so sincere, so linked to both thought and mechanics, it lays bare all kinds of correspondences and emotions. I find it a shame to cover all that up with technical polish. Qn: With the examples of your work represented in IDENTITY Insight: Unfolding the Visual Narrative, are there any anecdotal notes that may give insight into your artist vision to a new viewer? I have been watching my father succumb to Alzheimer’s. These drawings use my father’s and my common memories as a starting point to translate dementia into a drawing method. The frustration of drawing in and erasing out images to fit my narratives mimics what I see happening to my father in his effort to recognize in the moment his own personal narrative and memories.